Smartphones and tablets are convenient if only listening or viewing is involved. Typing on them becomes cumbersome and problematic since the virtual keyboard occupies too much onscreen space. 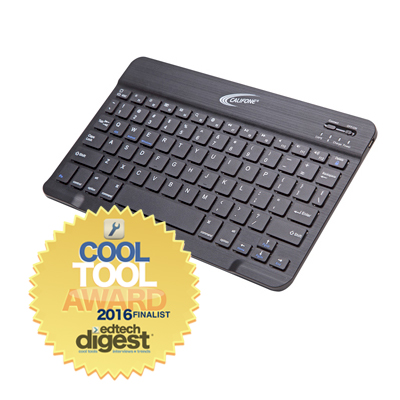 For typing while working from any mobile device, the Bluetooth KB4 offers full-sized connectivity. It enables you to type as you learned, but on a wafer-thin design that’s as unobtrusive as the device itself. Once the KB4 is synced to any Bluetooth enabled iOS, Windows, or Android device, the device’s virtual keyboard disappears. This means students will see the entire display, meeting key PARCC & Smarter Balanced requirements and EPPA21, NCSC, WIDA and DLM standards.